The Value Plus variety store at Fairview. POLICE are seeking witnesses to two burglaries at New Norfolk following the recent arrest of a man over similar incidents. Detective Inspector Craig Joel last week said a 33-year-old Bridgewater man was in police custody and assisting with inquiries in relation to a series of business burglaries across southern Tasmania. Inspector Joel said detectives investigating a burglary at the Kingston Harvey Norman store had visited a house at Bridgewater where they located a suspect, along with a white Mercedes Benz car allegedly stolen from Kingston, and electrical goods allegedly taken from Harvey Norman. 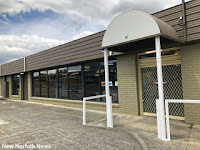 “As part of the ongoing police investigation, the man is also being questioned in relation to burglaries at the IGA Supermarket and Coles Express Service Station in New Norfolk on July 5,” Detective Inspector Joel. It is believed the supermarket referred to is the Fairview Value Plus variety store which is presently closed while new owners take over. "Anyone with information that could assist the police investigation is asked to contact Tasmania Police on 131 444 or Crime Stoppers on 1800 333 000," Inspector Joel said.